A highly skillful striker, Bradenton alum Jozy Altidore burst into MLS at the age of 16 with the New York Red Bulls towards the end of the 2006 season, scoring four goals in just five starts. Jozy scored his first MLS goal was a game-winner against the Columbus Crew. Altidore then became not just the youngest player to appear in an MLS playoff game, but the youngest to score in one as well. It didn't take long for the USMNT to take notice. The following season, Altidore continued his prowess by spending much of the season as partner to NY’s Colombian star Juan Pablo Angel, scoring nine goals. He also helped the USMNT U-20 team to a creditable quarter-final finish in the World Cup in Canada, and won his first senior cap when he came on as a substitute in the 1-0 Nelson Mandela Challenge Cup win in South Africa. On February 6, 2008, Altidore received his first start up front for the senior USMNT team, and rewarded Bob Bradley's faith with a bullet header to put the USMNT up 2-1 against Mexico just before half-time. The exhibition game ended 2-2. Altidore left MLS for Spain's Villarreal midway through the 2008 MLS Season. A record outgoing transfer for MLS, Altidore brought in reportedly over $10 million dollars. He was loaned to Xerez in February '09 and then to to Hull City in the English Premier League for the 2009-10 season. Hull was relegated at the end of the season with Jozy returning to Villarreal. In January, 2011, he went on loan to Bursaspor. In the summer of 2011, he signed with AZ Alkmaar in Holland's Eredivisie. In July, 2013 Jozy moved to Sunderland in England's Premier League. He won US Soccer's Male Athlete of the Year award in 2013. That same year he joined the newly formed FIFA Anti-Racism Task Force. In Feb 2014 he became an ambassador for the UK-based charity Show Racism the Red Card. Altidore returned to MLS with Toronto FC in Jan 2015. He won the US Soccer Player of the Year award in 2016. 2017: Started against Serbia on Jan 27, his 100th cap. Started the Mar 24 World Cup qualifier against Honduras and against Panama in the WCQ on Mar 28. Started the World Cup qualifier against Trinidad & Tobago on Jun 8. Subbed on against Mexico on June 11. Started against El Salvador in the quarterfinals on Jul 19. Started the Jul 22 semifinal against Costa Rica and scored. Stared the final against Jamaica on Jul 26 and scored. In the starting lineup for the Sep 1 qualifier against Costa Rica. Started the World Cup qualifier against Panama on Oct 6 and scored two goals. Started against Trinidad & Tobago on Oct 10. 2016: Started against Iceland on Jan 31 and scored. Started against Canada on Feb 5 and scored. Subbed on against Guatemala in World Cup qualifying on Mar 25 and 29, scoring on the 29. Missed the Copa Centenario with an injury. Started the World Cup qualifier against St Vincent and the Grenadines on Sep 2 and Trinidad & Tobago on Sep 6. Scored twice against T&T. Started against Cuba on Oct 7 and New Zealand on Oct 11. Started against Mexico on Nov 11 and against Costa Rica on Nov 15. Won the US Soccer Male Athlete of the Year award and the Futbol de Primera Player of the Year award. 2015: Started against Chile on Jan 28 and scored. Started against Panama on Feb 8 and Denmark on Mar 25. Scored against Denmark. Started against Switzerland on Mar 31. Started against Guatemala on Jul 3. Started against Honduras to open Group A play in the 2015 Gold Cup on Jul 7 and against Haiti on Jul 10. Started the Sep 5 friendly against Peru scoring both goals in the 2-1 win. Started the Sep 8 friendly against Brazil. Started the Confederations Cup playoff against Mexico on Oct 10. Started against Costa Rica on Oct 13. Started the World Cup qualifier against St Vincent and the Grenadines on Nov 13 and scored twice. Started against Trinidad & Tobago on Nov 18. 2014: Started against Ukraine on Mar 5. Named to the final World Cup roster. Started against Azerbaijan on May 28th, Turkey on June 1st, and Nigeria on June 8th during the World Cup Send-Off Series. Scored twice against Nigeria. Started against Ghana in the World Cup Group G opener on June 16th. Started against the Czech Republic on Sep 3. Started against Ecuador on Oct 10 and Honduras on Oct 14. Scored against Honduras. Started against Colombia on Nov 14 and converted a penalty. Started against Ireland on Nov 18. 2013: Started against Honduras on Feb 6th, Costa Rica on Mar 22nd, and Mexico on Mar 26th. Opened the scoring in the 4-3 win over Germany on Jun 2nd. Started against Jamaica in the Jun 7 World Cup Qualifier, scoring. Started against Panama on Jun 11 and scored in the 36th minute. Started against Honduras on Jun 18 and scored in the 73rd minute. Started against Bosnia and Herzegovina on Aug 14th and scored three goals. Subbed on in the second-half against Costa Rica on Sep 6. Started against Jamaica on October 11 and scored. Started against Panama on Oct 15. Started against Scotland on Nov 15 and Austria on Nov 19. Named US Soccer's Male Athlete of the Year. 2012: Started against Italy on Feb 29th. Came on as a second-half sub against Guatemala on June 12th. Started against Jamaica on Sept 7th. Second-half sub against Jamaica on Sept 11th. 2011: Started against Argentina on March 26th. Scored against Canada in the June 7th Gold Cup opener. Converted a penalty against Slovenia on November 15th. 2010: Scored against Turkey in the Sendoff Series. Named to the World Cup squad. Played n all four of the USA's games in South Africa. Scored against Poland in the October 9th friendly. 2009: Brought on as a late substitute against Mexico during the Feb 11th Qualifier. Scored the first goal in the 2-2 draw with El Salvador on March 28th after coming on as a 60th minute substitute. Had a hat-trick on April 1st against Trinidad & Tobago. Key part of the US attack for all five Confederations Cup games, including scoring against Spain in the semifinals. Came on as a sub against Mexico on Aug 12th. Started against Slovakia on Nov 14th and Denmark on the 18th. 2008: Called in to January training camp. Won second cap as a second half substitute in 2-0 friendly win against Sweden. Pulled down in front of goal a few minutes later, he drew the PK from which Landon Donovan scored his record 35th goal for the US. First start against Mexico February 6 in Houston saw him score the second US goal with a fine header in 2-2 exhibition tie. 2007: First senior cap as a sub in 1-0 win in South Africa, November 17. 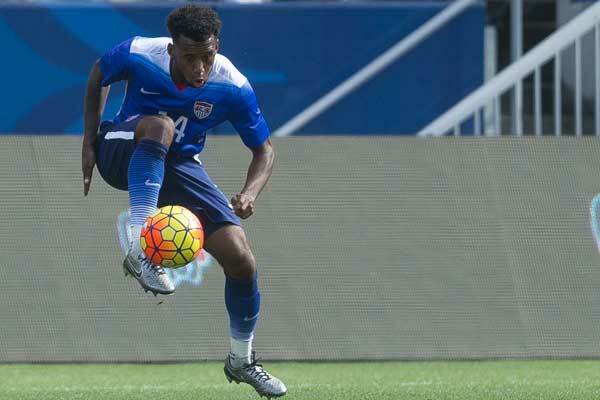 Scored four goals in nine games (eight starts) for the U-20 team, including two goals at the U-20 World Cup in Canada. 2006: Was invited to three U-20 camps. 2005: Five games (two starts) for the U-17 team, including two appearances at the U-17 World Cup. 2017: Won the MLS Cup, Supporters' Shield, and Canadian Championship with Toronto. 2015: Made the playoffs with Toronto. 2014-15: Played the first half of the Premier League season with Sunderland. Signed with MLS and Toronto FC during the January transfer window. Helped Toronto make the playoffs in his return to MLS. 2013-14: In his debut season with Sunderland, finished 14th in the Premier League and made the finals of the League Cup. 2012-13: Another strong season with AZ, scoring over 30 goals across all competitions including the winner in the KNVB Beker (domestic cup) final. Moved to Sunderland in the summer of 2013. 2011-12: Finished 4th with AZ in the Eredivisie. 2010-11: Spent the first half of the season with Villarreal where he was a regular in Cup games. Loaned to Bursaspor in January, 2011. Joined AZ Alkmaar in Holland on July 15th. 2009: Loaned to Xerez in the Spanish second division after attracting interest from major European clubs during the January transfer window. Loaned to English Premier League club Hull City for the 2009-10 season. 2008: Transferred to Villarreal in Spain's La Liga for a record $10 million dollar transfer fee. Scored his first goal in La Liga on November 1st against Athletic Bilbao and got his first start on November 30th against Recreativo Huelva. 2007: Nine goals and four assists for New York in 24 games overall (17 starts). 2006: Four goals in nine games overall (five starts ) for New York. Youngest to start in an MLS playoff game (0-1 home loss to DC United) and youngest to score in one as well, (1-1 tie at DC United).